Crofts Estate Agents are pleased to offer for LET this spacious terrace property which is located within close proximity to Grimsby town centre. Internal viewing will reveal a lounge, dining room and a modern kitchen and bathroom. 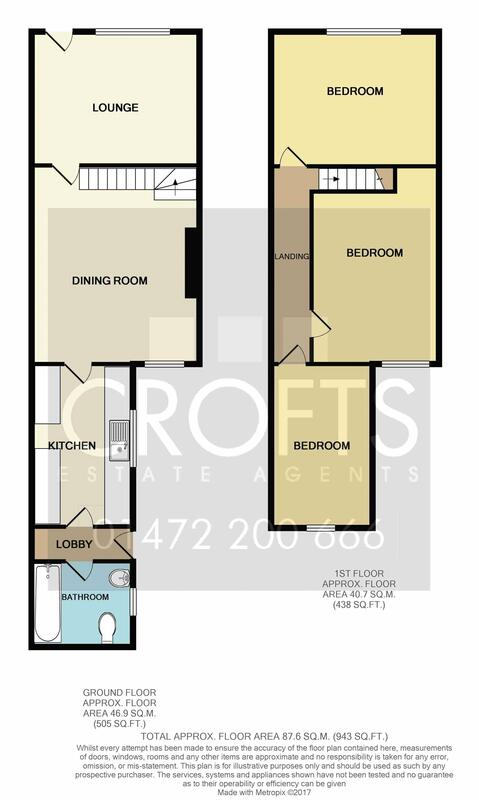 To the first floor there are three bedrooms making it ideal for a family. There are low maintenance front and rear gardens and the property also benefits from uPVC double glazing and gas central heating throughout. . Working tenants are preferred, no pets, no smokers. The lounge is accessed through a uPVC front door with a uPVC window to the front elevation, a radiator and carpeted floor. The dining room has a uPVC window to the rear elevation, a radiator and carpeted floor. The kitchen has a uPVC window to the side elevation, vinyl flooring and a range of fitted units to base and eye level with a stainless steel sink and drainer and complimentary tiling. A lobby area has a uPVC door to the rear garden and vinyl flooring. The bathroom has an opaque uPVC window to the rear elevation, a heated towel rail and vinyl flooring. There is also a white three piece suite. The first floor landing has a carpeted floor. Bedroom one has a uPVC window to the front elevation, a radiator and carpeted floor. Bedroom two has a uPVC window to the rear elevation, a radiator and carpeted floor. Bedroom three has a uPVC window to the rear elevation, a radiator and carpeted floor. Both the front and rear gardens are low maintenance.